Often known as the planet’s most successful species, ants have called Earth home for over 140 million years. Although they may all look the same to most people, there are about 12,500 known species of ants and scientists believe at least twice as many species of ants have yet to be discovered! Since ants are notorious for their ability to conduct orchestrated invasions, they certainly won’t have any trouble finding their way into your home! Ants live in almost every known environment in the world except Antarctica and a few remote or inhospitable islands. Minnesota alone is home to more than 100 different ant species. They may even be the most numerous of all the insects. Their numbers boggle the mind. One source estimates that there are nearly one quadrillion (1,000,000,000,000,000) ants living on the earth at any given time. When combined, all ants in the world would weigh about as much as all the human beings in the world. Yikes! That is a whole lot of ants! Their success in so many environments has been attributed to their social organization and their ability to modify habitats, tap resources, defend themselves, plus an ability to solve complex problems. Most kinds of ants make their homes in tunnels in the soil or in wood. They live and work together in communities made up of hundreds or thousands of individuals, almost all of them relatives. 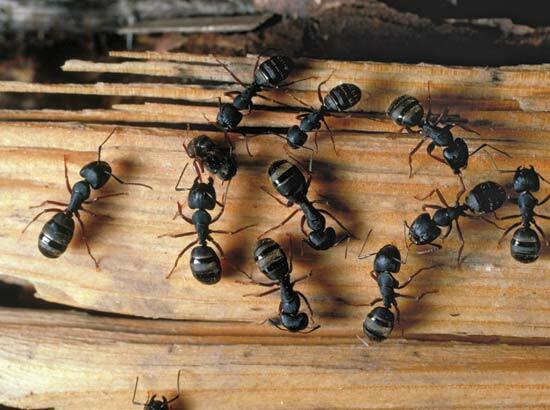 The most likely species to be infesting a house in Minnesota is the carpenter ant. Ants are useful for clearing out insect pests and aerating the soil. On the other hand, they can become pests when they invade our homes, yards, gardens and fields, which is why most homeowners contact a Minnesota pest control exterminator who will locate the nest location(s) and eliminate all the ants. They are well trained in locating their nesting location and terminating the colony. They are able to tell the difference in ant species, which means they require different treatments.